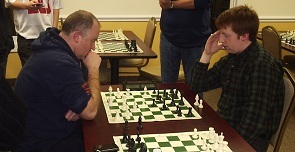 Friday Blitz was an intense contest between NM Ian Harris and Expert Alex Eydelman for 1st place and between CCFC Director Melvin Patrick and Michael Morin for the U1800 prize. Besides some fireworks in the games, there were few surprises in the standings and Patrick defeated Morin twice to finish comfortably ahead of him. Meanwhile, Harris and Eydelman split their all-important showdown with two draws and tied for 1st place.